For Christmas, I wanted to make Martin a chair that he could use when he goes to the cricket or goes camping. He's already got a self-inflating camping mat so the obvious chair to make was a "camping mat chair kit": a kind of fabric sleeve that would slide over his existing mat and turn it into a chair. Finally, admittedly a few months after Christmas, it's done! I couldn't find any instructions online about how to make such a thing so gleaned information about commercial chair kits from promotional materials and online reviews. It turns out there were many details to get right. I'm wanting to share here what I learned along the way so that other people don't have to sew and resew their mat chairs quite as many times as I did in order to get a functional product! Regular blog readers might want to stop reading here - what follows is detailed and rather long! A chair kit has two pockets or sleeves that cover what will become the seat and back of the chair. Each of these has a pair of rigid rods ('stays') installed vertically in the fabric to give the chair rigidity. Without these it will crumple when you try and sit in it. The two pockets/sleeves are sometimes sewn together. They are always also joined by the adjustable webbing straps. Some designs have a third strap or belt that goes around the hinge area where the back and seat of the chair meet. Martin has a three quarter length self-inflating mat, so the best option for his chair kit seemed to be to fold the mat into three, giving him a double thickness of mat on which to sit (like this). If you have a full-length mat you could still fold it in three (it'd just end up longer than his). You could instead make a kit that would turn a full-length mat into a lounger, or to fold it in four so that both the back and the seat are double thickness. You could also make a single sleeve that is sealed at the bottom of the seat portion of the chair but is open at the top. Thermarest's lightest chair kit is like this. Even though it's open at the top, the fabric shouldn't be able to slide down off the mat due to the rigidity of the stays in the chair kit. Note that my fabric choices are pretty random as I wanted to use stuff I already owned as much as possible. For the surfaces that would touch the body I wanted to use something that was sturdy but had a comfortable finish. I chose an old cotton 20kg rice sack (we go through one of these every couple of months and I find the sacks immensely useful!). I do wonder if the cotton might feel unpleasant if it gets wet, though: time will tell if it was a good choice. For seams that I thought would be under strain (i.e. most of them) I used 'extra strong' polyester thread, which is a similar strength to linen thread. I sewed these seams in back-stitch. Elsewhere I used a normal weight of polyester thread and sewed in either running stitch or overstitch. I hand-sewed the chair kit as that's what I'm familiar with. I wasn't confident that I could make good measurements of such a squishy object using a tape measure: instead I pinned the fabric directly around the mat. I did this very carefully as I didn't want the hassle of mending any punctures in the mat. I think it would be much better if you made the 'back' portion of the chair longer than mine (the back is to the left of the photo above) as mine only just provides enough back support to be comfortable. 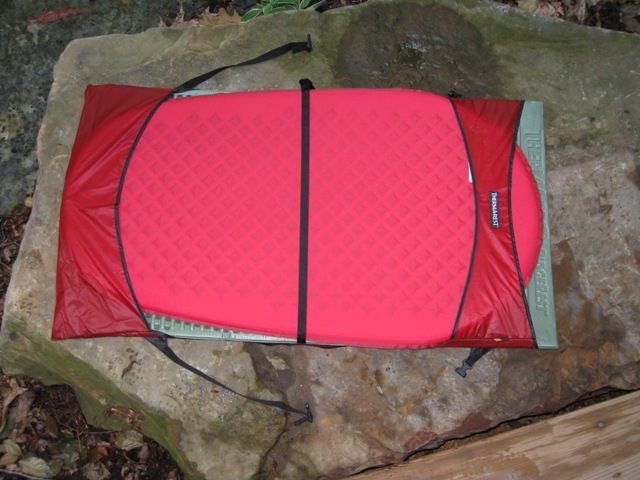 The back doesn't need to be all that high to be comfortable, though: look at this photo of the Big Agnes, which featured in a review that explicitly mentioned that the back was a good height. The mat's valve should be in the back of the seat, not the part you sit on. If your design has the mat's valve being covered by a seam, make sure you cut a slot for it :-) I cut slots for the valve on both corners of the top of the back so I can insert the mat either way up. NOTE: Do not sew anything yet. You need to install the channels for the stays before you sew up the pockets - retrofitting them into a sewn pocket is hard work! The rigidity of your chair comes from the stays - without them it will simply crumple and won't be a chair at all. The stays are thin rods that need to be strong and tough but also have a bit of flex. Commercial chair kits seem to use either round or flat rods and make them from either aluminium or carbon fibre. You can see pictures of the Exped's stays in the photos towards the bottom of this blog post. If you want to use aluminium for your stays you could look into aluminium welding rods - that's what I originally considered using. In the end, though, I used some thin bamboo stakes (about 9mm diameter) that we'd originally bought for the garden. The length of the stays in the seat portion of the chair isn't all that important, although I suspect that as long as is convenient would be a good idea. The length for the ones in the chair back, though, determine how high a back your chair will have and hence what sort of back support it will give. Ours aren't as long as would be ideal. The maximum length for stays as thick as mine is about 4cm shorter than the length of the seat back (or seat seat) they are to be attached to. They can't be as long as the channel as the extreme ends of the channels will compress down too much to fit the stay. If your stays are thinner than mine you'll be able to make them a bit longer. The stays are installed in long, thin channels attached to the outside of the chair kit. These photos (from here) show you the placement and width of the channels on the Exped chair kit. The Thermarest has them narrower and further apart than the Exped and the Big Agnes puts them right out in the side seam (I think they can only manage to put them there because the stays aren't removable). I decided to make the channels on mine a bit wider than any of those as my stays are thicker. Note that I wouldn't have needed to do this if I didn't want my stays to be removable: in that case the channel would only need to be as wide as the stays. By accident I also ended up with mine more towards the middle than the commercial ones but it seems to be working fine. Many commercial chair kits seem to simply sew the stay channels closed. However, the Exped has made theirs removable, meaning that their chair kit can go in the washing machine. I've done the same. Note that there have been several modifications to the chair kit since this photo was taken - this portion is now wider and the webbing has moved. Because the stays for the seat and the back of the chair kit are of different lengths I've labelled them so I can easily tell which is which. I wanted something sturdy. I was out of the black fabric I'd used earlier and the the orange fabric I'd used earlier seemed too prone to ripping to be used in such an exposed location. In the end I used denim from an old pair of Martin's jeans. The four channels all came out of the portion of one leg below where the knee had worn through. I reinforced the channel at the end that attached to the closed end of the pocket (bottom of photo) by sewing backwards and forwards until I'd done 5 lines of stitches. This was done following pictures of one of the commercial ones, but I can't remember which one or find any relevant pictures now. I also reinforced the gap that the stay comes out of by stitching many stitches on top of each other at both ends of the gap. There will be webbing sewn in under each channel (see below). At these points I stitched backwards and forwards till I had three lines of stitches total. NOTE: You're still not ready to start sewing! You'll need to sew webbing in underneath the channels at the same time as you sew the channels to the pockets. The straps connect the back and seat portions of the chair. Ideally they are adjustable so you can alter how much back support you get from your chair. Crazy Creek has some at the extremes, but some also seem to have them at different locations on each side. I originally placed ours in a similar location to that of the Exped and found that this gave very little back support. I ended up putting them at the far ends of the back and seat (like the Big Agnes does) and that's working well. The Exped seems to get good support from their location (you see this clearly at 2:40 in this video) but I couldn't figure out how they were achieving this. The straps need to pull on the channels at two points in order to spread the load. Big Agnes and Crazy Creek achieve this by sewing a triangle of fabric to the attachment points. That seemed too fiddly for me! The Exped simply uses two pieces of webbing, but these are fitted with triglides so you can adjust the tension. That didn't seem fiddly to sew, but reviewers on the internet commented it was fiddly to get the tension right on them and you had to adjust them whenever you significantly changed your sitting position. That didn't seem ideal either! In the end I sewed a loop of webbing towards the closed-pocket end of the channel, with the ends about 3cm apart and the whole thing angled towards the open end of the pocket. The main strap was then attached such that it could move freely along the loop and naturally pull it at both ends (see next section). Before I sewed this loop of webbing under the channel I melted the raw ends so that they couldn't fray. I was concerned that the stay might otherwise cause wear. The main strap consists of two pieces of webbing joined with a side release buckle. The socket part of the buckle is attached to the 'back' of the chair, the part with the tines to the 'seat' of the chair. The socket part is attached to the loop of webbing sewn into the channel by a very short ring of webbing. The ring encircles the webbing loop. Both ends of the ring are sewn under so there are no raw edges. Hopefully the photo below makes that clearer! Note that the straps don't need to be all that long, as you'll find that you won't use the chair at a right angle but bent much tighter in. This photo gives a good idea of a typical configuration for a chair in use. Some commercial models have a strap that goes across the middle of the mat (i.e. between the chair's back and seat). You can see it clearly on this picture of one the newer thermarest model lying flat; these pictures show how it works when the chair is assembled. I couldn't work out the point of that strap so didn't incorporate one into my design. Now I wonder if it may help to ensure that your chair kit and mat don't part company at the bottom of the back. Martin has found that the mat has a tendency to curl inwards away from the stays where the back and seat portions meet, shortening the effective length of the back. I may well add such a strap to Martin's mat chair at a later stage. I'm thinking of stitching either a loop of elastic or a loop of webbing (with a buckle) to the bottom of the 'back' portion of the chair kit. Another potential purpose of this strap is simply to prevent the folded over portion of the mat from flapping up. The Thermarest chair kit that uses it has much shorter pockets than my design. I stitched a piece of tape to the 'back' portion of the chair kit so it could be neatly rolled for transport and storage. To figure out where to position it I simply placed the two pockets on top of each other, rolled them up then pinned the centre of the tape to a location that looked like it would be convenient. In a happy accident, the piece of tape I used is long enough (at around 50 cm) to accomodate the mat as well. Martin simply deflated the mat while it was in the chair kit, folded it in on itself and found he could comfortably tie it with the tape. He did find that the mat quietly re-inflated itself after a bit, though, turning it into a fairly bulky object. Proper compression straps (like Crazy Creek use) would prevent this, but the current set-up isn't problematic enough for me to change it. One thing I would do differently next time is I'd attach the tape to the 'seat' of the chair kit rather than the 'back'. The seat has the long sections of the straps: these are easier to tuck inside when you roll it up than the short sections that are attached to the back. Attaching the tape to the 'seat' would mean you wouldn't have a loop of webbing floating free and able to catch on things (you can see the loop I'm talking about in the photo above). Some commercial models also include a carrying handle, sited to be accesible both when the chair is assembled and when it is rolled up. NB: my chair kit weighs 420g. Thermarest Compack weighs either 190g or 255g depending on width. Make sure you reinforce the top of the channel very well indeed, at the point where the stay rests (stitching across may not be sufficient, you may need to reinforce the fabric). I have a similar chair and the one failure I've experienced is that the stay pushed through the fabric at the top of the channel. It seems to depend on sitting style though - my wife has an identical chair and her stays are still fine. Thanks for the warning :-) I'll keep an eye on it and reinforce it if that seems necessary. What was your total cost if you don't mind me asking? I don't mind at all. I made almost all of it out of materials I already had (bamboo stakes we weren't using in the garden, the legs of denim jeans where the knees had worn through, the sacks we buy our rice in etc. ), so it was almost free. All I bought was the webbing and buckles, which was around $5-$8, at a guess. But if you made the whole thing from new materials it would obviously be a lot more, although I have no idea how much.